by Gail Devoid, NeedForBeads Inc.
Quick to Stitch! 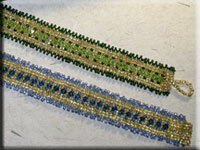 2-Drop Peyote bracelet glitters with crystals. Bonus: Peyote toggle instructions included.